This quick sandwich delivers a great blend of flavors with ham, sweet pineapple and zesty BBQ sauce. 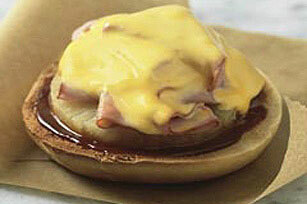 Spread bagel with barbecue sauce; place on microwaveable plate. Top with ham, pineapple and cheese. Microwave on HIGH 30 sec. or until cheese begins to melt. Prepare as directed, covering pineapple with 1 slice OSCAR MAYER Fully Cooked Bacon, cut or folded in half, before topping with cheese.